The WICKED – Are You Wicked? 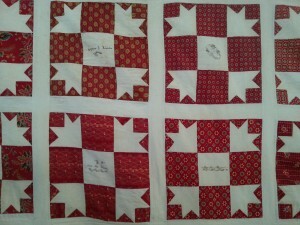 quilt challenge was sponsored by Cherrywood Hand Dyed Fabrics. 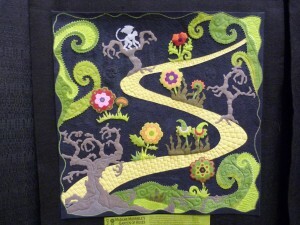 The challenge was to use Cherrywood “Wicked Greens” and black to make a 20″ square quilt using the theme WICKED. 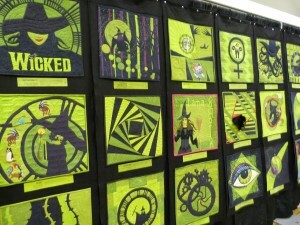 Most were influenced by the Broadway musical hit, but some expressed other interpretations of the word wicked. 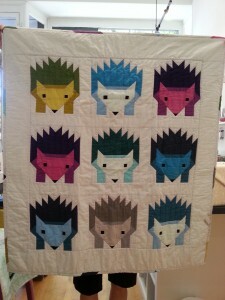 A total of 114 quilts were submitted. Of these, judges selected 27 to hang on Broadway for two months. 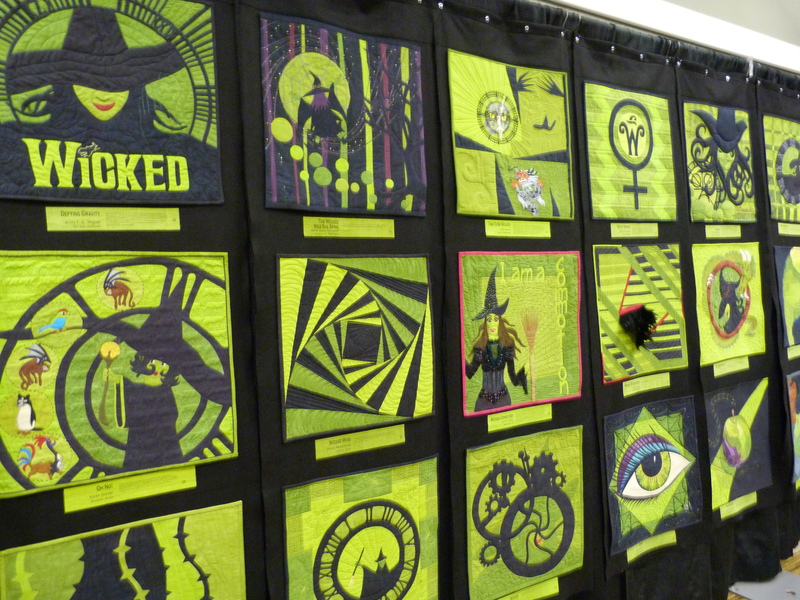 All the quilts were displayed in a special exhibit at the Paducah show on a long wall and they looked spectacular. The quilt on the right, It’s All About the Tornado, by Pat DuBois of Woodbury, MN, was the Viewers Choice. It was my favorite too. 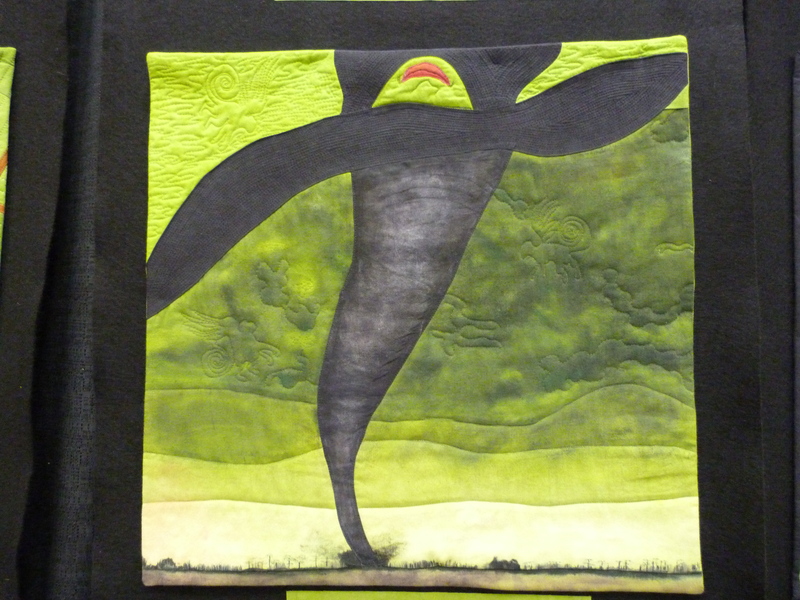 Pat knew immediately that she wanted a tornado for her challenge. 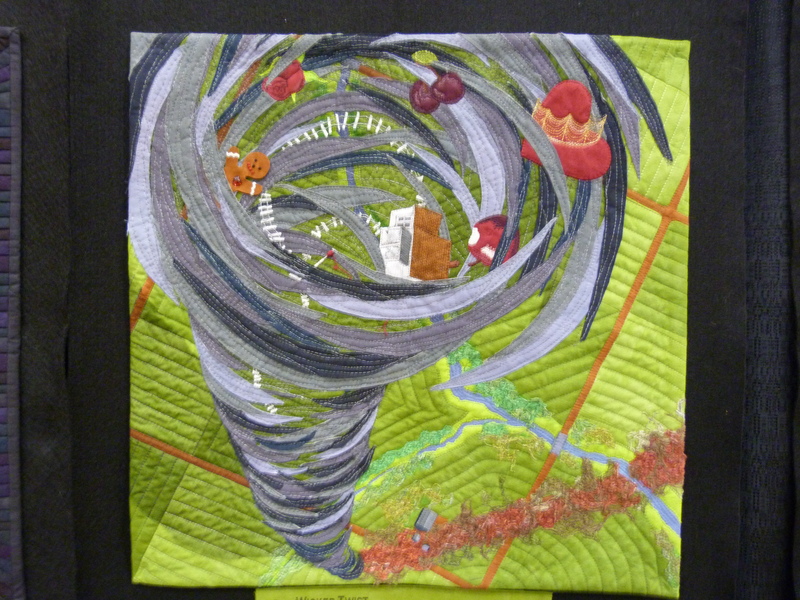 “Whether you call it a tornado, a cyclone, or a twister…. it’s the most powerful and WICKED”. Techniques include paper-piecing, curved piecing, needle turn applique, fusing, embroidery and embellishment with crystals. 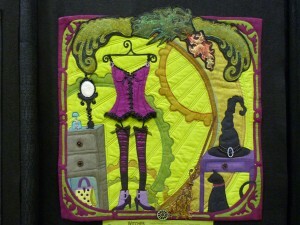 Wicked Sorcery, on the left, was made by Judy O’Connor Chaffee of Naperville, IL. Judy witnessed the devastating I-5 tornado in 1957 in Kansas City and still has a fear of tornadoes. In reading Wicked she was fascinated by Elphaba’s use of sorcery. 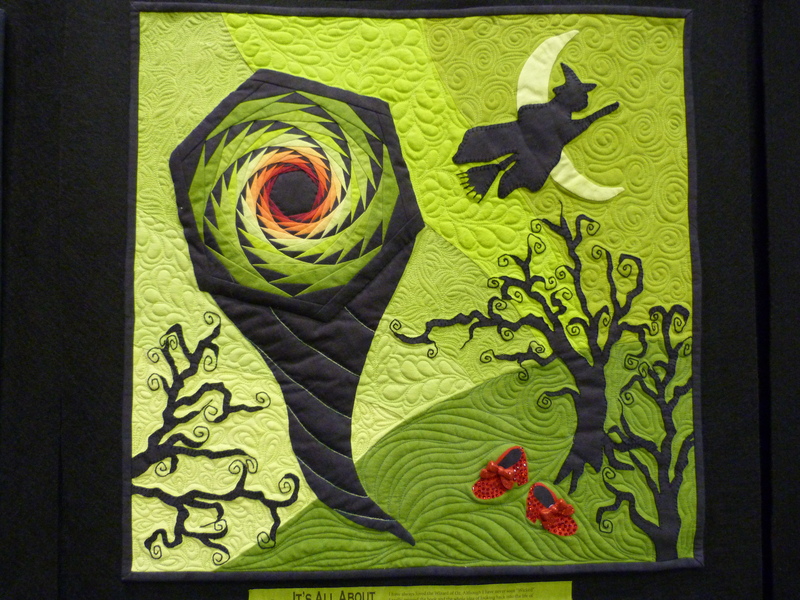 “My quilt is a kind of dream world and answers the question: Could Elphaba and her flying monkeys also create tornadoes.” The monkeys are machine quilted in the green sky around the funnel of the tornado. 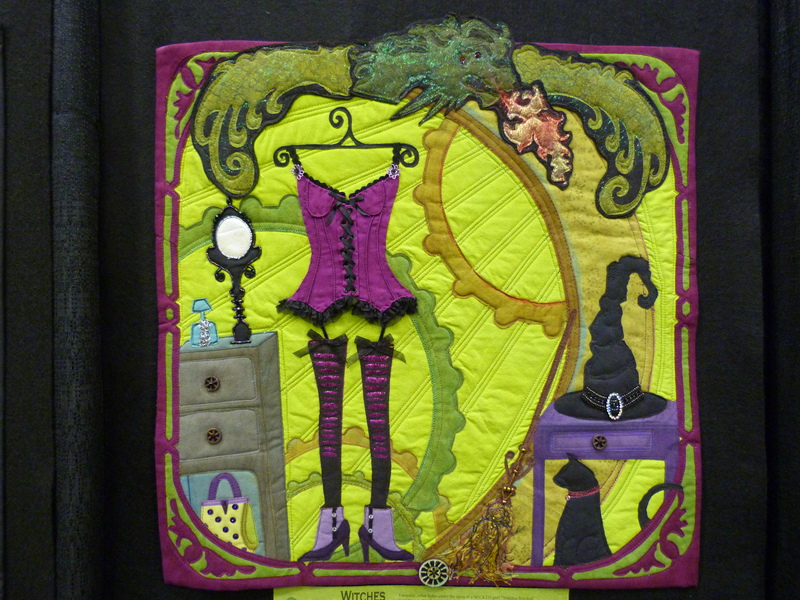 On the right, Shelli Ricci of Apple Valley, MN takes a whimsical look inside the closet and under the dress of one “not-so-nice” girl in her quilt, Witches Britches. “I think it would be fun to wear a pretty purple corset and stockings. Maybe good girls have WICKED secrets hiding in their closets too!” Shelli embellished this gem of a quilt with Angelina fiber, crayons, rubber stamps, beads and bling. Madame Morrible’s Garden of Hexes, by Robin Gausebeck from Rockford, IL won second place in the contest. This is a WICKED perversion of the traditional Grandmother’s Flower Garden, populated by hex-agonal flowers. Who knows what lies hidden in the garden guarded by a flying monkey beside the yellow brick road. The final tornado, Wicked Twist, is the creation of Linda Syverson-Guild from Bethesda, MD. The twister has gathered from classic tales involving WICKED attitudes. As well as Dorothy’s house, drawn into the funnel are Snow White’s apple, the Queen of Hears’crown, a spindle from Sleeping Beautry, cherries taken from Rapunzel and Rumpelstiltskin, and a gingerbread man from Hantzel and Gretel. I’m sure this wonderful exhibit will travel extensively around the US in the next couple of years. If you have a chance to see it, I’m sure you will enjoy the creativity around this WICKED theme and be inspired. 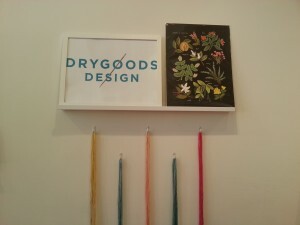 Drygoods Design quilting and sewing shop moved from Ballard to Pioneer Square, Seattle about six months ago. 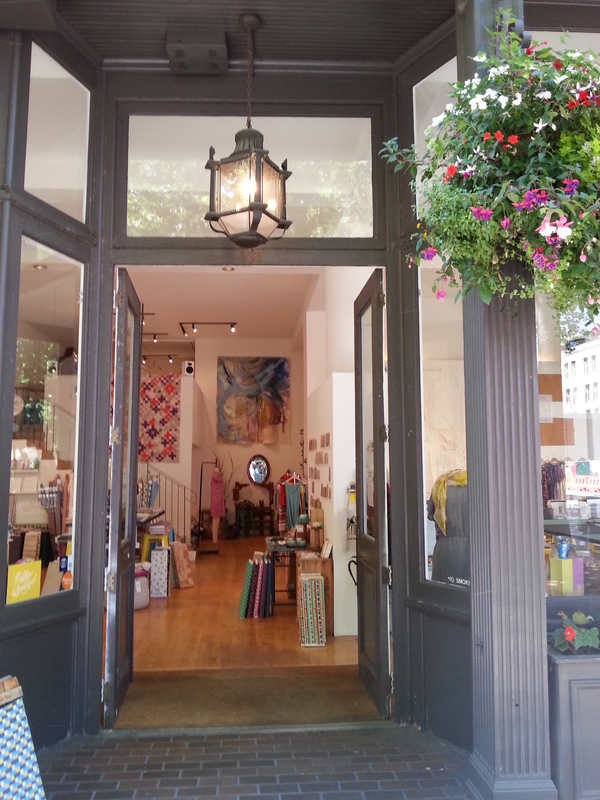 The shop is located at 301 Occidental Avenue S in one of the old buildings close to 1st Avenue. 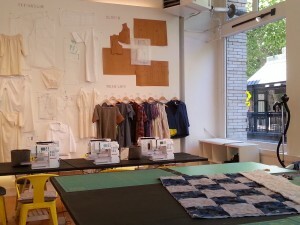 The space is a large airy room with a high ceiling and has enormous windows so there is plenty of natural light. It has a fresh modern feel and is inviting. 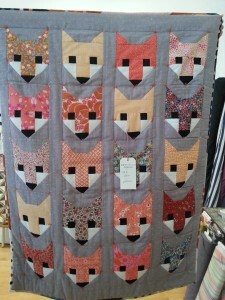 There are plenty of notions, patterns and of course a choice of fabrics. 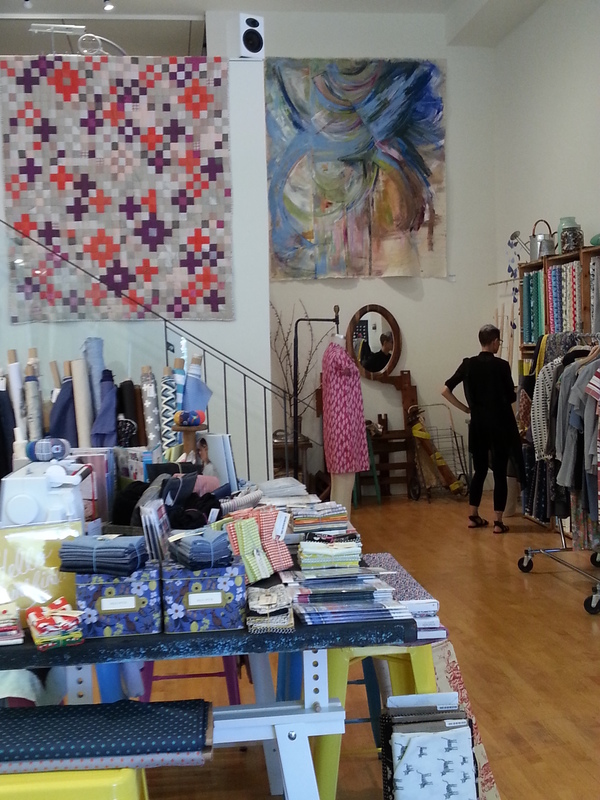 They offer both sewing and quilting classes. 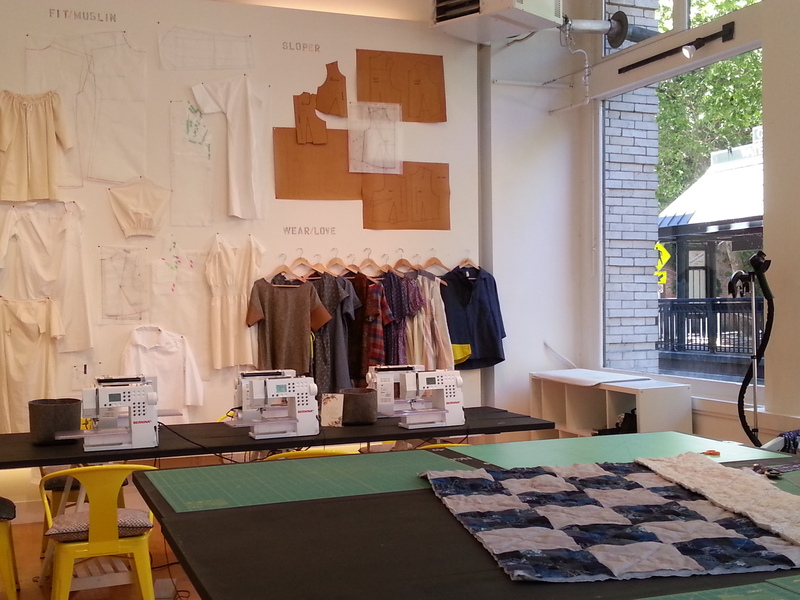 One wall is devoted to dress making with patterns displayed and there is a large work table. 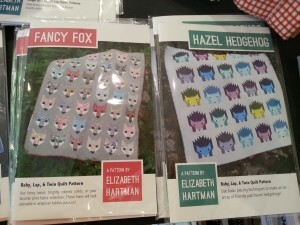 I Love these Elizabeth Hartman patterns for crib and twin beds. Here’s the Fancy Fox and Hazel Hedgehog quilts that are displayed in the store. 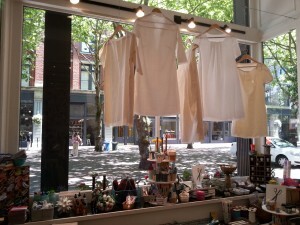 If you are in downtown Seattle in the Pioneer Square area, this shop is definitely worth a visit. At the June meeting of Kitsap Quilters Guild, our guest speaker was Susan Underwood, member of the American Quilt Study Group and co-founder of the Washington State Quilt Study Group. 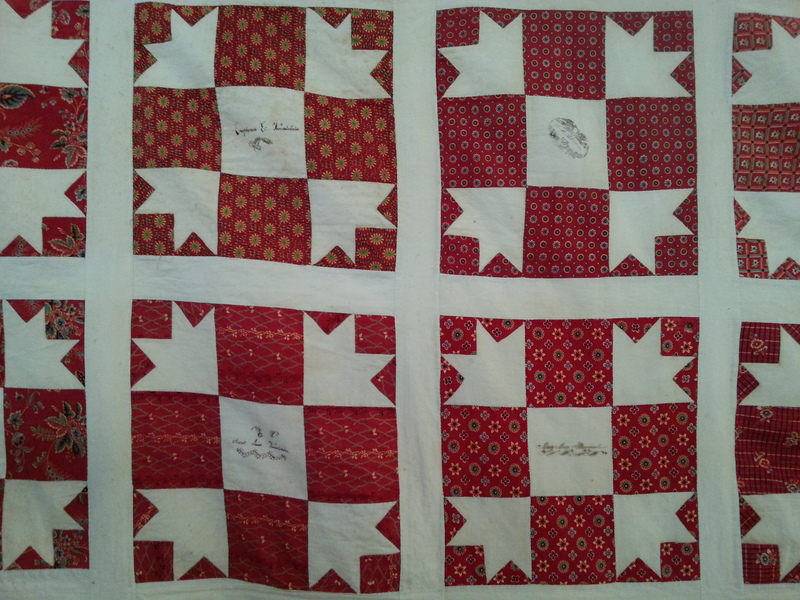 The American Quilt Study Group establishes and promotes the highest standards for interdisciplinary quilt-related studies, providing opportunities for study, research, and the publication of work that advance the knowledge of quilts and related subjects. Susan has researched and collected quilts since the 1980’s, with a particular interest in 19th century signature quilts and the 20th century quilts that we are likely to find on the West Coast. 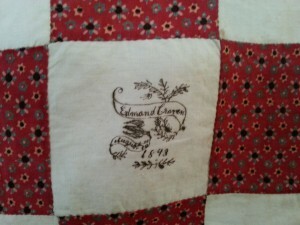 This beautiful quilt top is a spectacular example of an 1840’s signature quilt and is from Bucks County, Pennsylvania. 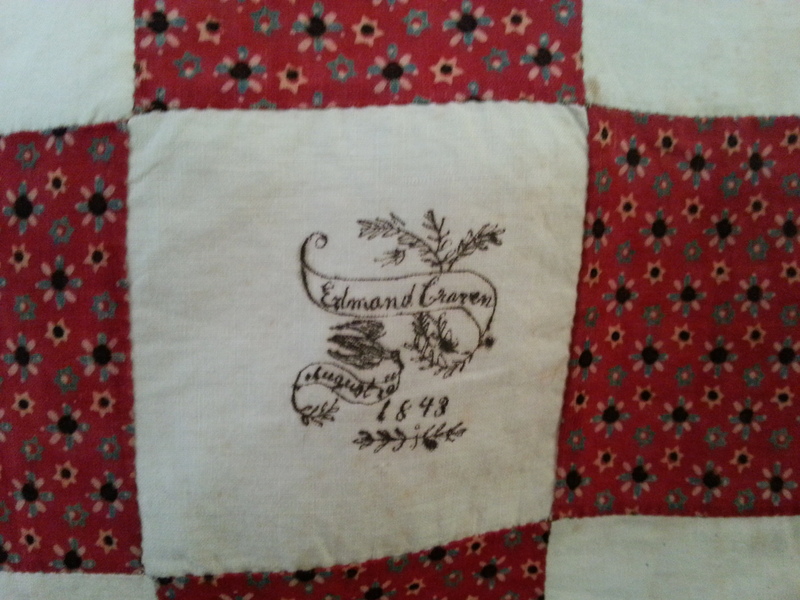 The style is like those made by the Quakers but the names are Dutch and can be traced back to Dutch immigrants from the Dutch Reform Church. 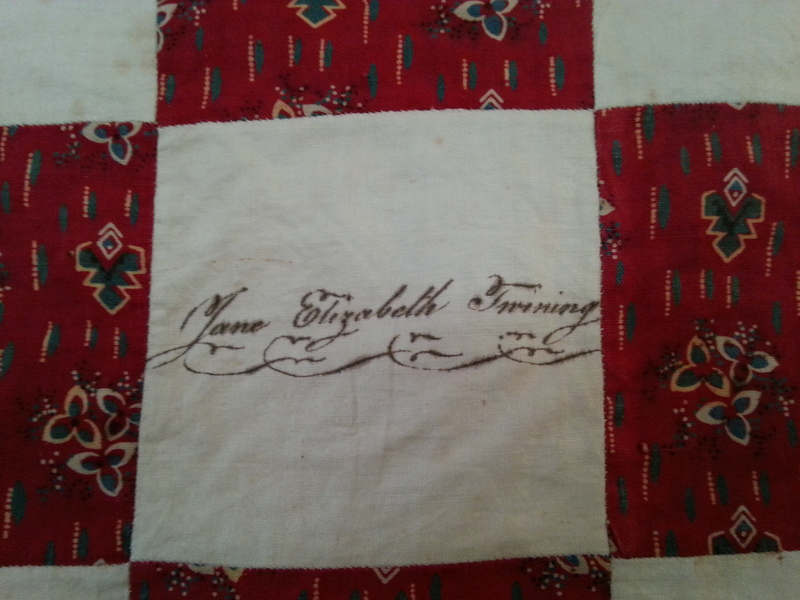 Signature quilts may be useful for genealogists especially when there are dates and blocks with the names of several family members. This quilt top traveled from Pennsylvania to Eastern Washington and Susan purchased it at the estate sale of the daughters of Mary Vanartsdalen. 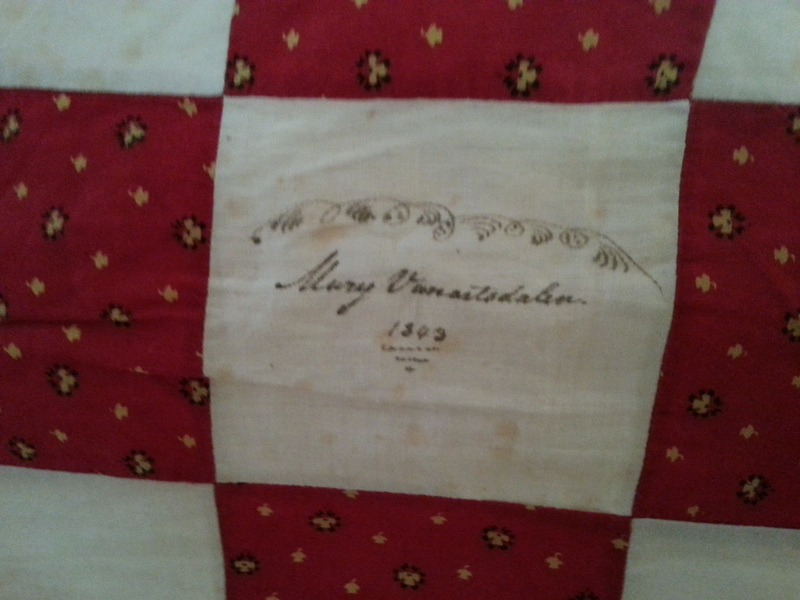 Mary’s signature is shown below along with the date of 1843. 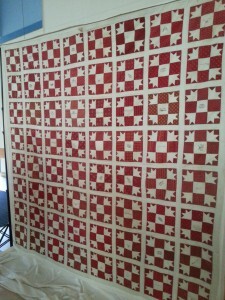 The quilt top has a great variety of turkey red fabrics including several better quality pieces from France, England and Scotland. 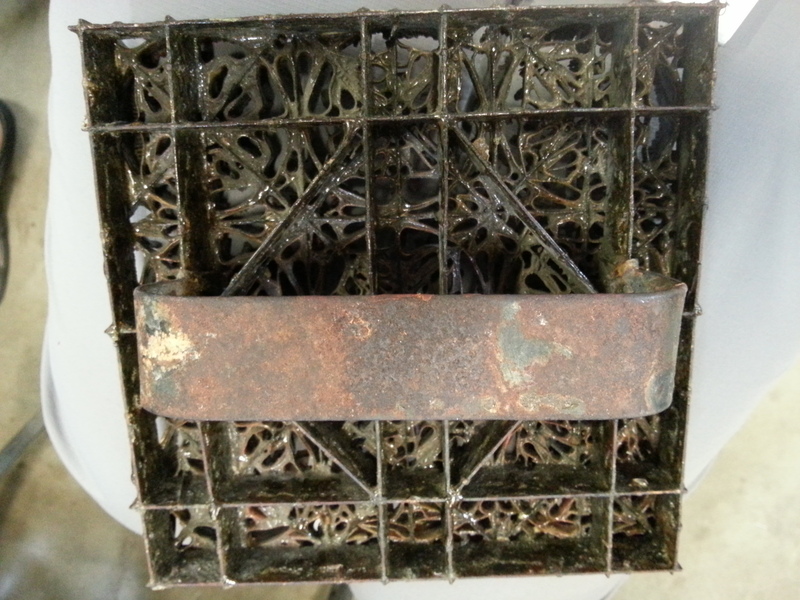 The lower quality pieces were made in the USA where the production process was not yet as sophisticated as that used by manufacturers in Europe. 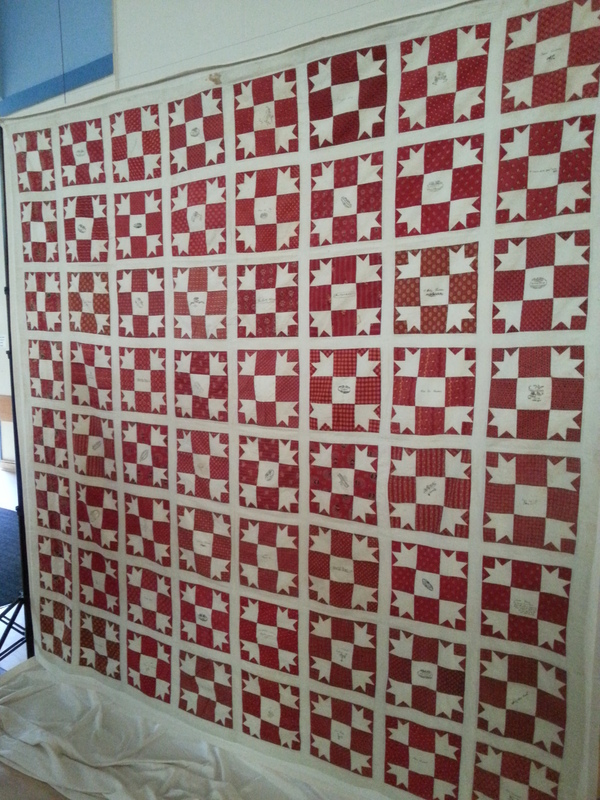 The 64 red and white Turkey Tracks blocks are all signed in the center white squares, except for the final column of blocks on the left side which are blank. In this Victorian era, fancy stationary was all the rage and people used inked stamps with ornamental designs, then added signatures. 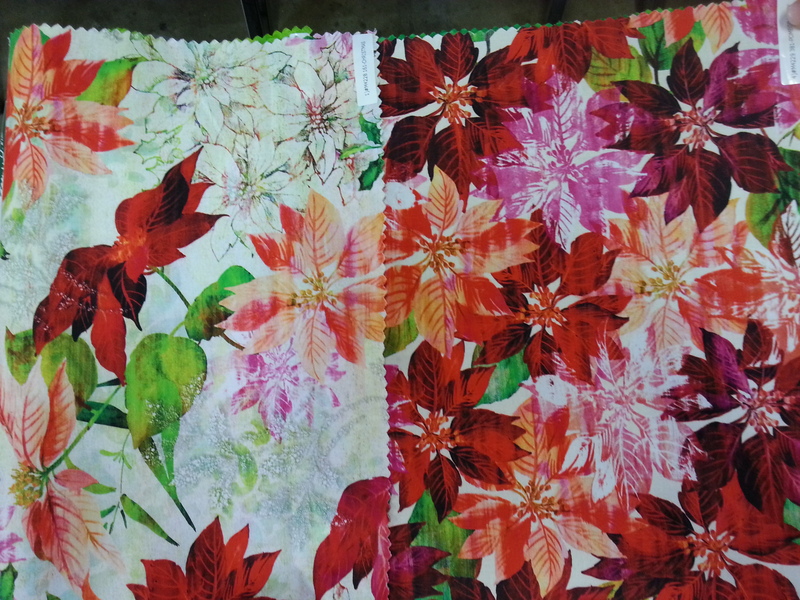 They used these on fabric as well. Some examples are shown below. 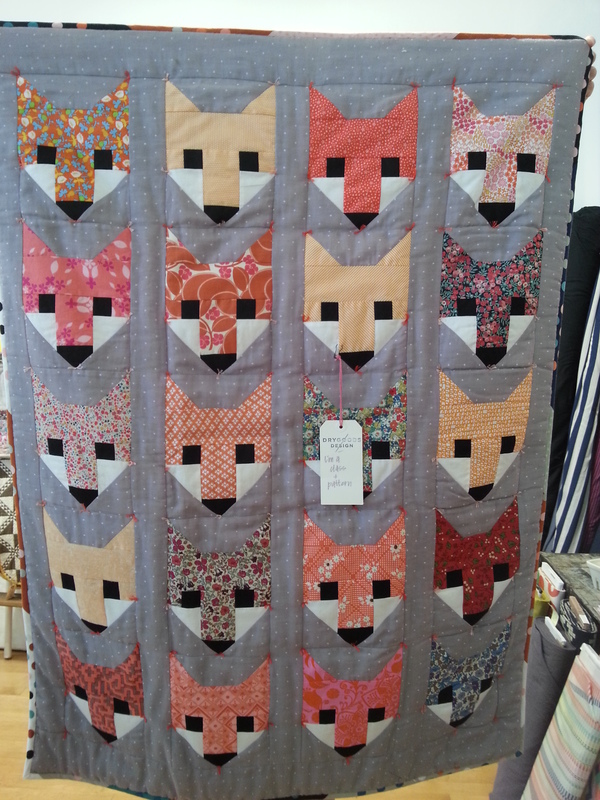 Thank you to Susan for permitting me to share this incredible quilt top. Last week I shared pictures of the Hoffman Fabrics facility in Mission Viejo, Southern California. 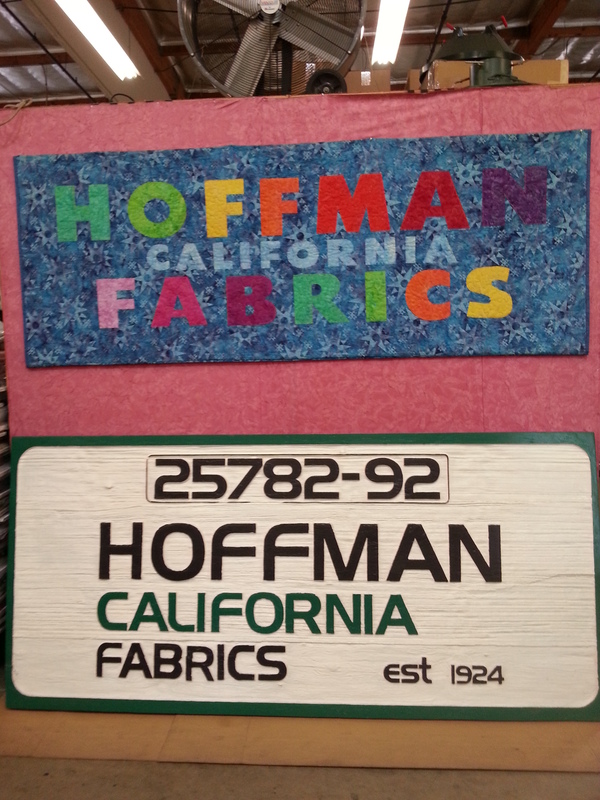 In this blog, I’m writing about the fabrics produced by Hoffman. 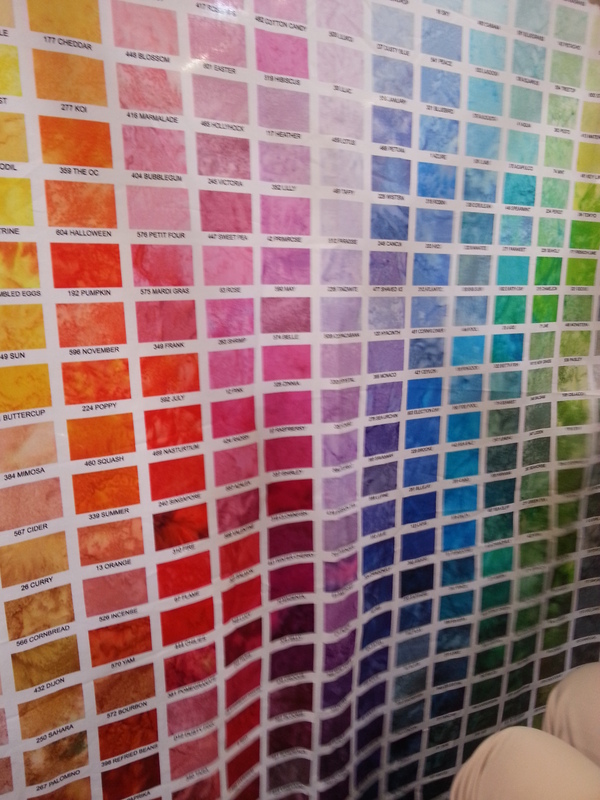 We began our tour with an interesting presentation from Michelle Flores, Marketing and Media Coordinator, who introduced us to the fabric manufacturing process and showed us some examples of the recently designed fabrics that were launched at Spring Quilt Market a few weeks ago. 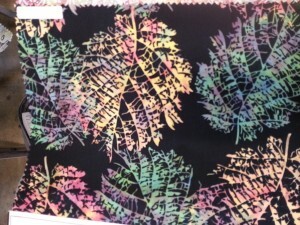 They are very excited to have recently acquired the capability of printing digitally which enables the printing of hundreds of colors in one piece of fabric and the use of much finer lines in the design. 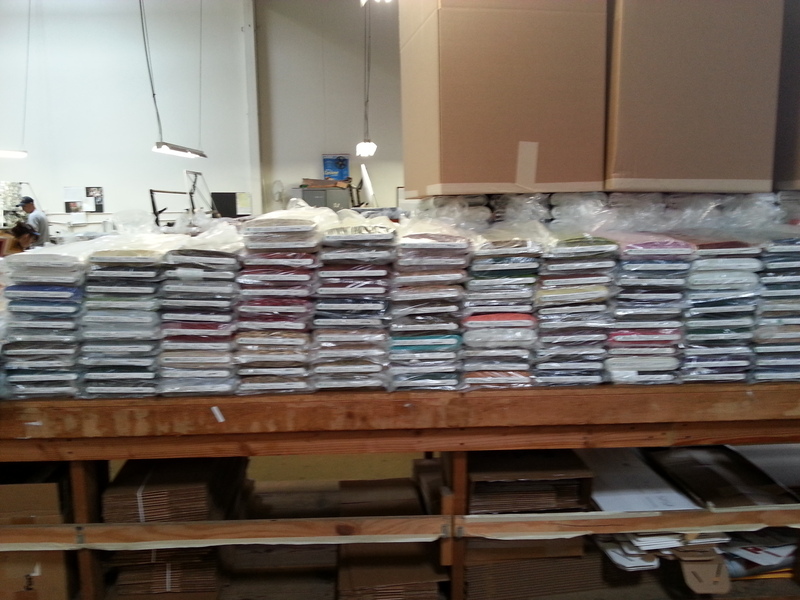 The color chip fabric has 374 different colors! In traditional screen printing, there are usually no more than 12 colors in a fabric. 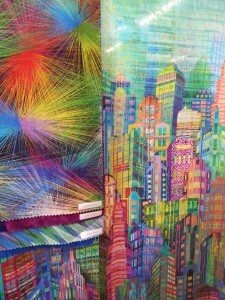 Here are examples of digitally printed fabrics which illustrate the enormous array of colors. 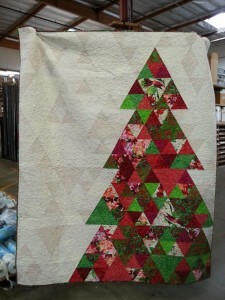 The Christmas tree quilt is made using the poinsettia fabric. These fabrics are digitally printed in Pakistan. Hoffman cotton comes from a variety of sources, including the United States. 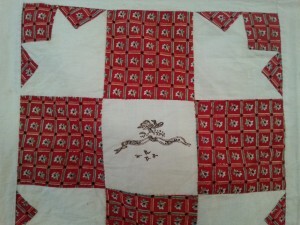 All the cotton is woven overseas mostly in Pakistan, Indonesia and Java. 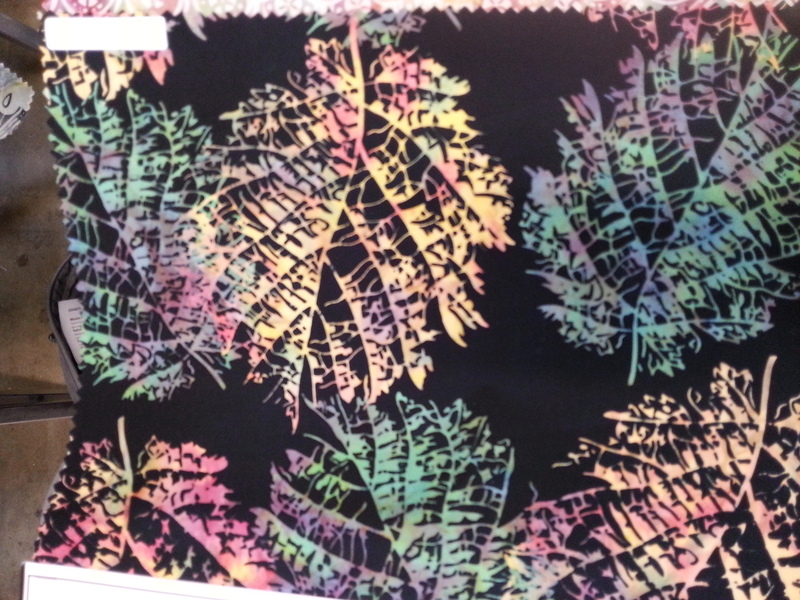 The Hoffman prints with metallics are manufactured in Japan and 3,000 yards are printed on each run. 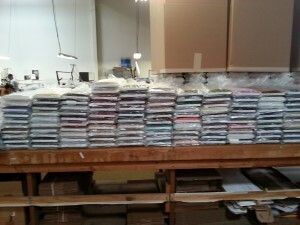 These have as many as 10 colors which are all screen-printed by a machine, printing each color in turn onto the cloth. 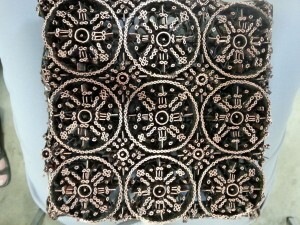 The metallic gold, silver or copper is applied as a paste after the rest of the printing is completed. Non-metallic prints are produced in Korea, Indonesia and Pakistan. 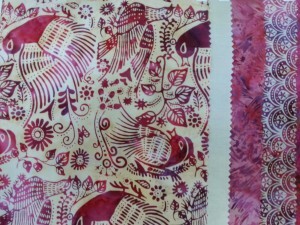 The batiks are made in Bali and here are two recent designs. 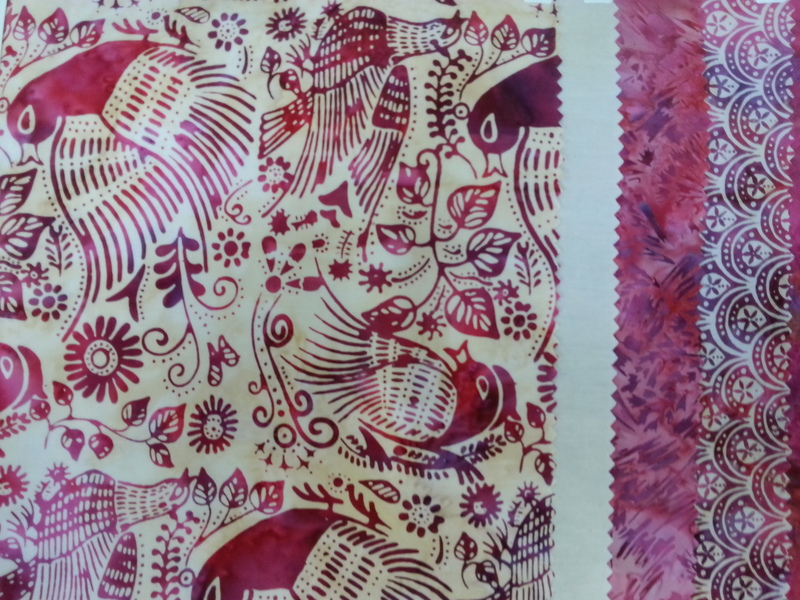 The cotton for batiks has to be of high quality to withstand the harsh process of dyeing and hand stamping with a metal chop. Each piece of fabric is 18-20 yards long and its production goes through several steps of dyeing and over-dyeing as well as hand stamping with the chop and the application of wax to achieve the patterns. 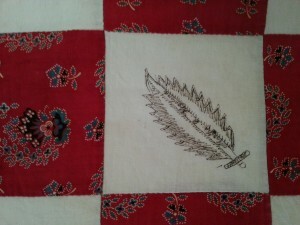 After this process the fabric is carefully checked for holes.The pictures show both sides of the chop, (one side with a handle), which is used for creating the patterns. 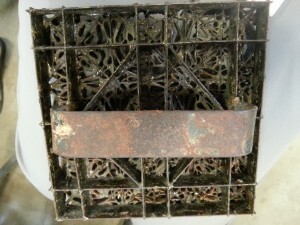 The chops measure 6-1/2″ x 6-1/2″ and are created from strips of copper in a steel frame fashioned in patterns copied from black and white drawings.They are dipped in wax which is stamped onto the fabric by hand. Then the fabric is immersed in a vat of dye, and later the wax is removed by boiling the fabric so that the melted wax comes up to the top of the vat and may be skimmed off. 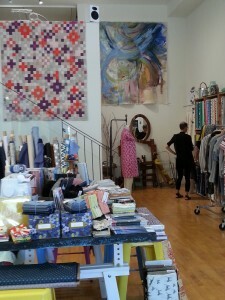 Each piece of fabric is unique. 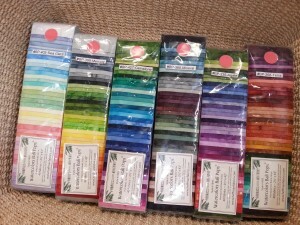 The packs of Bali-pops are popular. 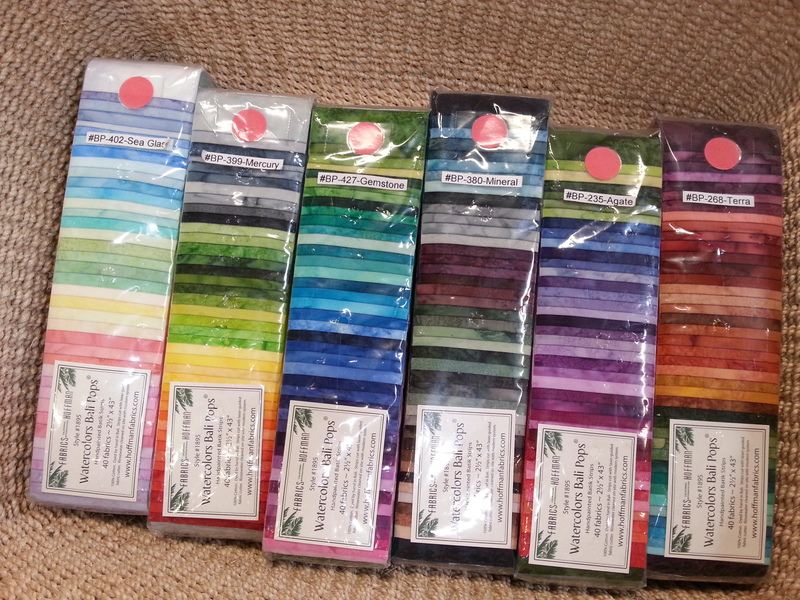 Each pack contains 40 strips. 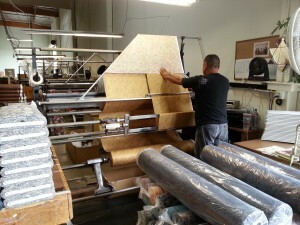 There is a large cutting machine that can cut through all 40 layers at once, but each piece of fabric must be ironed by hand on a huge table and the layers neatly stacked before being sliced into strips. 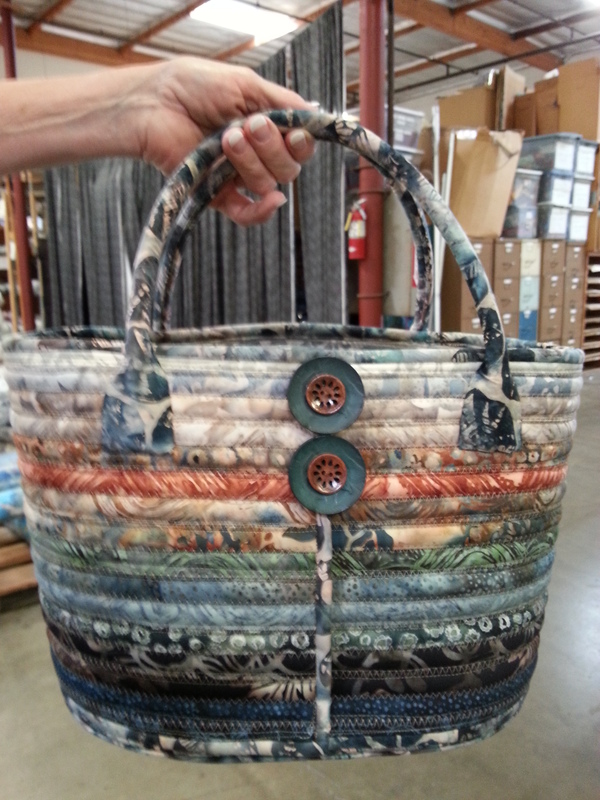 This attractive basket was made from one of Bali-pop packs. All in all, a fascinating tour which I highly recommend if you have the opportunity. 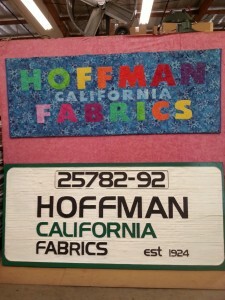 On my recent trip to teach at Beach Cities Quilt Guild in Mission Viejo, Southern California, I was fortunate that on the afternoon of my lecture, the guild had an organized tour of Hoffman Fabrics. 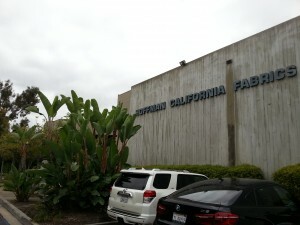 About 20 of us assembled in the warehouse and Michelle Flores, Marketing and Media Coordinator, gave us an informative presentation and showed us around. 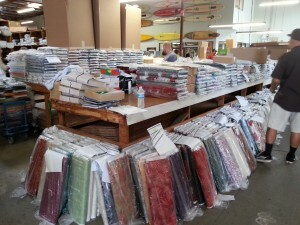 Hoffman Fabrics is a major manufacturer and wholesaler of printed cottons. 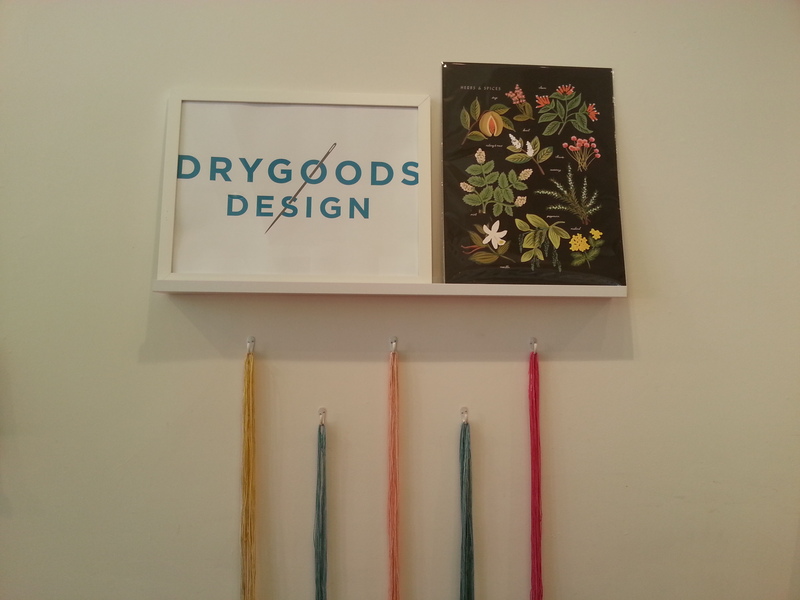 They are well known for their luscious prints and Bali batiks. There are numerous distributors in USA, Canada, New Zealand, Australia and Europe. 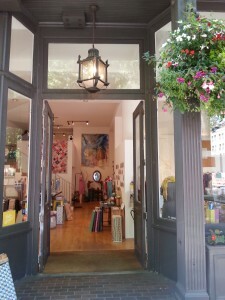 Their on-line retailers include E-Quilter, Batiks Plus and Hancock’s of Paducah. 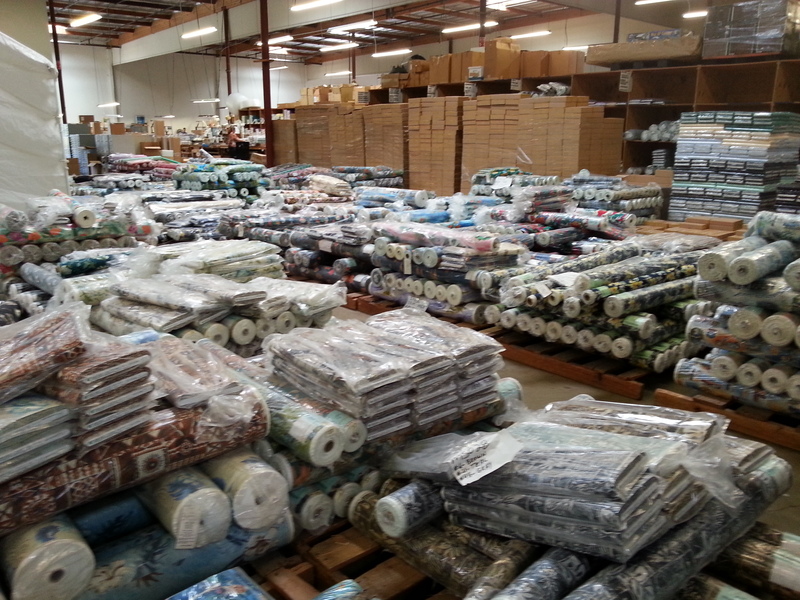 The fabric arrives from their overseas manufacturers in long rolls. 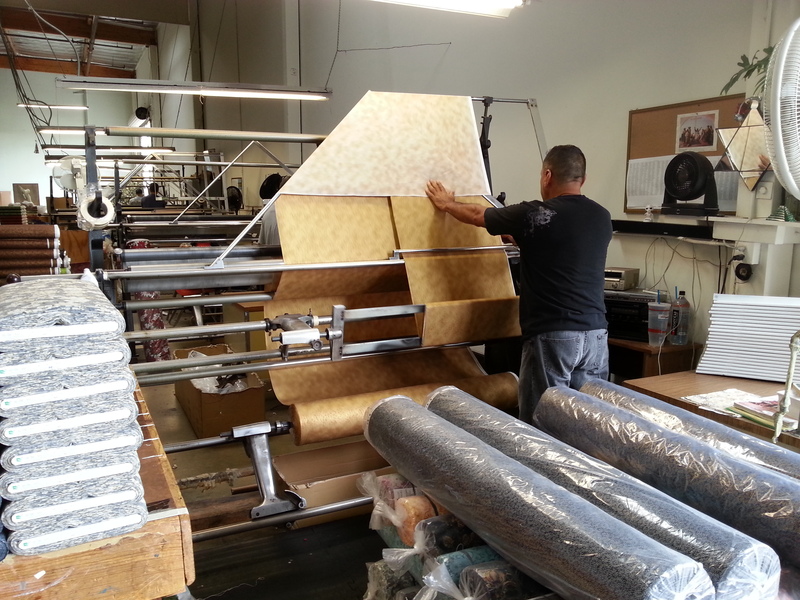 The picture shows the fabric folding machine that folds the fabric in half and winds it into bolts. Most bolts have 15-16 yards of fabric. 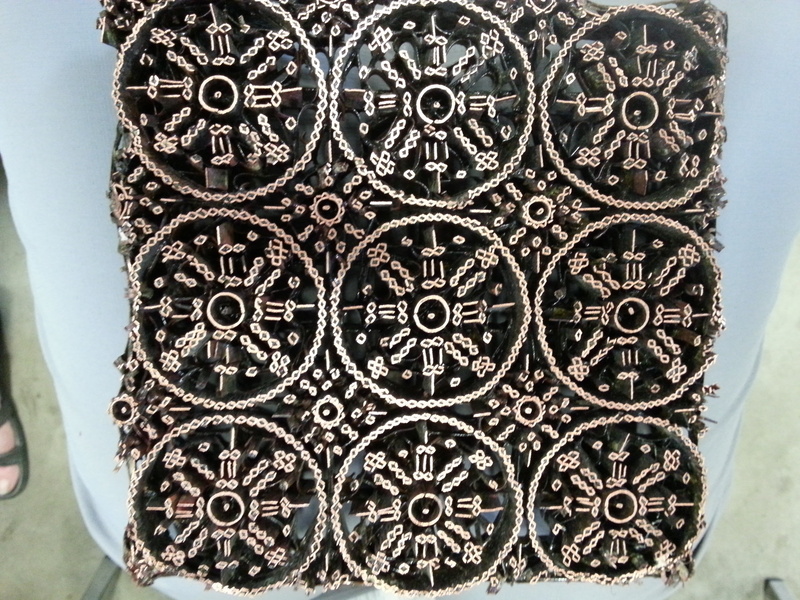 The newly wound bolts are then wrapped in plastic ready to be shipped to the distributors. 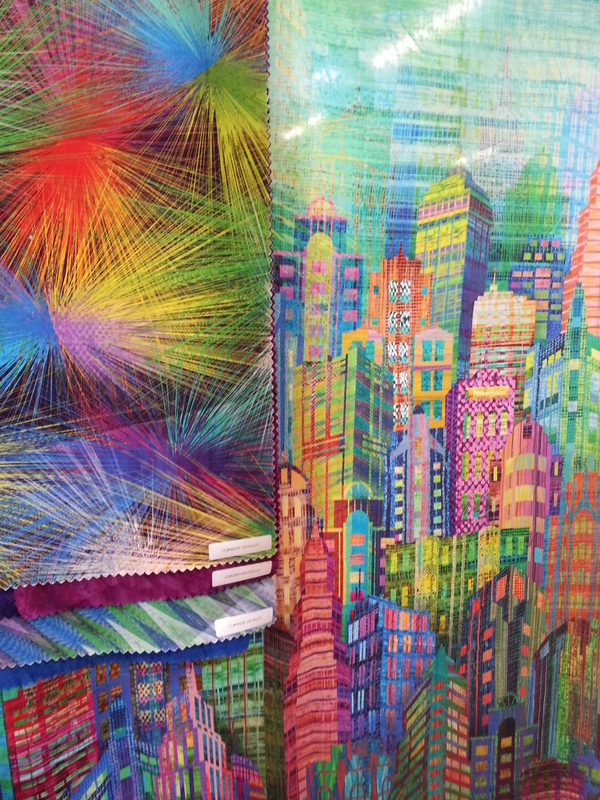 Next week in Part II, I’ll tell you about the fabric production and show you some examples of the new lines recently launched at Spring Quilt Market.